Versatile scattering machine designed to deliver even coating of paper and flooring. Feeding of the powder to the funnel shaped hopper is done by vacuum sucking or auger system. Inside the hopper the powder is uniformly distributed and the level is kept constant during the scattering process. The formation of cavities and decomposition of the material is avoided through the use of a special mixer (spiked roller). The scattering roller is mounted below the hopper and is designed according to the powder size. The powder is picked up by the scattering roller and stripped at a flexible doctor blade. The doctor blade design ensures an even dosing of the material over the whole scattering width. The scattering roller is driven by a servo drive, ensuring scattering of the required quantity (g/m2) onto the product. 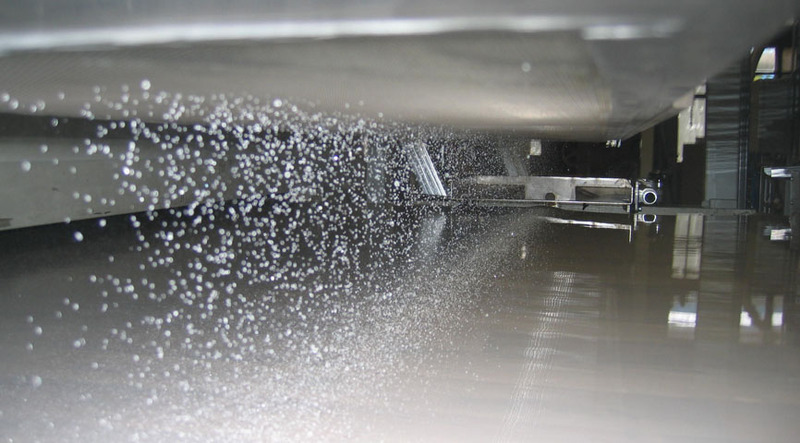 A specially designed scattering roller in combination with a modified oscillating brush-off device ensures an accurate and uniform distribution of the scattering material out of the scattering roll onto the substrate. All scattering machines are available in different sizes and capacities. Scattering machines can be supplied with vertical and horizontal transfer system for easy cleaning and maintenance work.